Keep Rain Gutters Clean - Clean your gutters at least 2x per year, definitely in the Fall time of year, when leaves are falling. Check your gutters operation during an active rain storm, to assure that none of your gutters are leaking or are over flowing. Make sure all connections have water tight fittings. Properly working rain gutter systems will divert a lot of potential wet basement problems, away from your home. If you are unwilling or can’t do your own gutter maintenance, the are service companies that do gutter cleaning and maintenance. Some gutter installers do this sort of service. 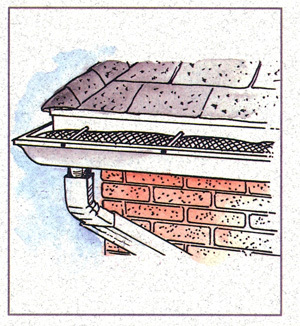 Install gutter guards to protect your rain gutters from falling leaves and other debris. 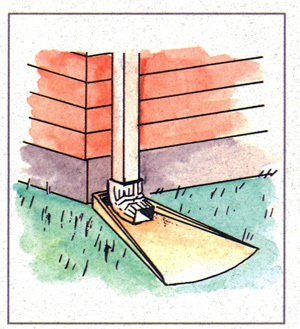 Add Extensions To Your Downspouts – Your down spouts should be directed about 10 or 20 feet past your foundation. The ideal situation is when they can discharge onto land that is sloping downhill, away from the basement. Resist burying your downspout extensions or connecting them to a drywell. Drywells will hold a limited amount of water and then start backing up. Your gutters will then spill all your roof water, right next to your home. If you do want to run your gutter extension pipes under the ground and away from your home, make sure the ends of the pipes drain out to daylight. You’ll need to be able to see the ends of these pipes to periodically check that they are open and draining properly. Never connect your rain gutters to the sewer system. 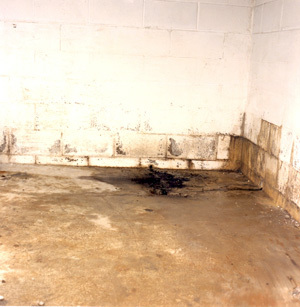 This can cause nasty backups, far worse than ordinary basement leakage! Check How Your Yard Slopes - The worst situation is when a hill or slope near your home, is directing surface water towards your basement. The ideal situation is for the top of your foundation to be higher than the surrounding yard, with all land sloping away from the home. The more surface water you can eliminate, the better your chances are to avoid basement water problems. In many cases, some minor re-contouring of your yard by a landscaper, is all that’s necessary. In other cases, a swale can be installed to direct water around your home, to a location where it won’t cause problems. A good landscaping contractor can advise you on your particular situation. Set Up An Automatic Dehumidifier – A good dehumidifier will control excessive humidity in your basement and help prevent moisture from causing problems. Sweating pipes, metal objects getting rusty and musty odors are all related to humidity problems. Get a dehumidifier with a deicer and a drain hose built in. The deicer will keep your unit from freezing up during heavy usage and the drain hose will keep all the water collected, drained out. If a regular collection pan fills up, the dehumidifier stops doing its job. A drain hose assures it will run dependably. Keep All Doors and Windows to the Basement Closed, Year Round! – Open doors and windows allow humidity, a direct path into your basement. Forget about bringing “fresh air” into your basement. All you will do is make your problems worse. When warmer, humid air enters your basement and comes into contact with the cooler walls and floors, condensation will occur and cause you “moisture related” problems. You will also save money on electricity for your dehumidifier by keeping the windows closed. Many basement waterproofing companies offer a free inspection and cost estimate to deal with your problems. Be aware though, their solution will likely be a product or service they want you to buy from them. Home inspection companies can evaluate your problem and will usually give you an unbiased opinion of your problem. There will most likely be a fee for this type service. Be aware though, many areas of the country offer no regulation of this type service or require licensing of home inspectors. Check their references and accreditation carefully before agreeing to their fee. Get several opinions about the cause of your problem and which solution is best for you. Check your Better Business Bureau for the track record of any company you consider hiring. Your state Bureau of Consumer Protection can also help you weed out problem contractors. Ask for references and talk with people who have dealt with each company you are considering. Ask for homeowners names who have had the exact same problem as yours. Ask to see each company’s Insurance Policy to make sure they have insurance. The best practice, is to ask your contractor for a Certificate of Insurance, in your name. This costs them nothing and a good company will have no problem obtaining you with one.